Newly Released Color Photo Shows A Bloodied George Zimmerman : The Two-Way The photograph, taken by a police officer, is the first high-resolution, clear view we've gotten of Zimmerman's injuries on the night he shot and killed Trayvon Martin. George Zimmerman's defense team just released a photograph they say was taken the night he shot 17-year-old Trayvon Martin. A photograph of George Zimmerman on the night he shot Trayvon Martin. A black-and-white photocopy of the picture had already been released, but this photo is the first high-resolution and clear view we've gotten of Zimmerman on the night of the shooting. 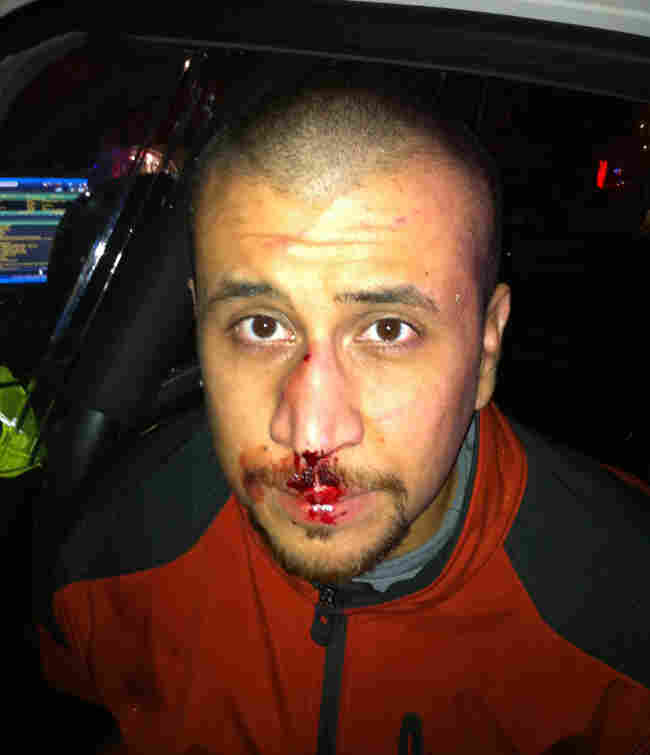 The image, taken by a police officer, shows blood dripping down Zimmerman's face, and his nose appears to be swollen. The photograph was released by Zimmerman's defense attorney. Zimmerman has said he shot and killed Martin on Feb. 26 in Sanford, Fla., in an act of self-defense. The incident became a national story as Martin's family and supporters have questioned why police took so long to arrest and charge Zimmerman and whether the black teen was the victim of racial profiling before and after his death. Zimmerman has been charged with second-degree murder. An image like this could play a central role in his defense because Zimmerman says Martin was banging his head against concrete, so he shot him to protect his life.